Today we'll chat a bit about the Throat Chakra or Vishuddha, which is the Sanskrit term and means 'purification'. The Throat Chakra is located at the center of the throat. The physical body areas associated with this chakra are the neck, jaw, throat, ears and mouth. 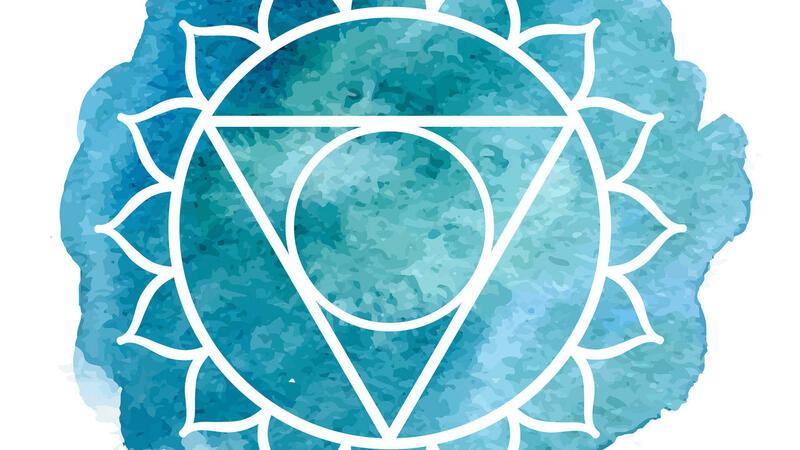 The color associated with this chakra is sky blue and is symbolized by a lotus flower with 16 petals. The petals are arranged around a circle with a downward facing triangle with another circle in the center representing a shining full moon. The color blue is associated with trust, wisdom, faith, purification and is said to benefit the mind and body. The main theme of this chakra is expression; to express ourselves freely and openly. The element associated with this chakra is space. Think of the qualities of space --> subtle, vast and expansive. The associated sense is the sense of hearing and the seed sound is Ham. When we are balanced in this energy center, we communicate clearly, we are able to express our feelings honestly and we become a very good listener. We will also feel a flow of creative ideas and expression. When this energy center is blocked or unbalanced, we have a difficult time communicating our truth and/or finding the words to express ourselves and our feelings. We may experience a low or weak voice or on the opposite spectrum, we may talk too much or too fast without saying much of anything and also engage in gossiping. We may also not engage in conversations, feeling our opinions are worthless and possibly experience a block in creative expression. The main function of this chakra is to help you speak your truth, release limiting beliefs and align with your authentic being. Ask this Question - Am I being truthful to myself and others? Wear the Color Blue - Either in clothing or jewelry or put a crystal in your pocket like sodalite, lapiz lazuli and/or turquoise. Use Essential Oils (follow directions and guidelines for use) - Use oils like peppermint, fennel or roman chamomile. You can also find blends already made for the chakras like here at Plant Therapy. Share in the Conversation - Trust that your opinions are worthy. If someone asks you to give input, take a deep breath and speak openly and honestly. Meditation - Meditate on the energy of your throat chakra in the sacred space you created and/or visualize a sky blue lotus flower or ball of energy extending out from your throat center. 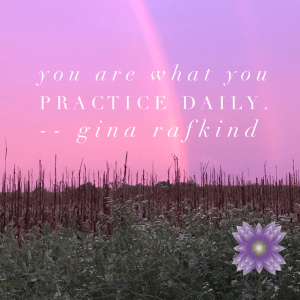 Speak Your Truth - Even if you start with yourself in the mirror, practice honoring how you are feeling and try expressing yourself by speaking your truth. Yoga - Of course yoga! You can ignite the space element in your practice by allowing yourself to flow freely and expressively as you move from pose to pose. We start at the earth feeling grounded and stable (think Tadasana, Mountain Pose) to flowing like water (think flowing Sun Salutations) to igniting the fire within (think core poses like Navasana, Boat Pose or Salambhasana, Locust Pose) to entering the sacred realm of the heart through heart openers (think Bhujangasana, cobra pose or Ustrasana, camel pose) and now expressing ourselves in our practice allowing our body to flow in however way it feels like flowing. Pranayama - There is a great breathing practice for this energy center; Bhramari Breath. It is a great tool to help become aware of this energy center. You will feel the vibration in your throat and skull. Chant or say the seed sound (silently or out loud) of this chakra which is Ham. As you begin to become more aware of Vishuddha, the fifth chakra, you will break the silence and freely express your truth and start aligning with your authentic nature. You will come out from behind the mask and not only be seen, but be heard. You have the right to express yourself freely. Know now that expressing your emotions is important and you are increasing your ability to openly and honestly express yourself. Acknowledge that you are confident in communicating your emotions to others and in sharing the wisdom deep within you. Feel joy in both your personal and creative expressions that flow from your heart, (and your throat).